The Additional Mumbai Suburban District Consumer Disputes Redressal Forum recently held a housing society guilty of deficiency in service for not paying attention to a severe leakage problem in his flat, and directed the society to pay 50% of the repair amount to a senior citizen. Reportedly the forum, denied any compensation “Since the office-bearers are devoting their services without charging anything to the society, if the amount of compensation is granted against the society, then it would be an additional burden on the members of the society and therefore our conscience does not permit us to burden the members of the society by awarding compensation against the society,“ the forum said on reportedly on Jul 19 2014. The Senior citizen in this case is one Mr. Manohar Ghansharamani a member of Rishi Dayaram Giduaml CHS where he has been residing with his wife and daughter since 1977. His grievance was; his flat had a persistent problem as the water tank of the building is situated on the top of his roof. He feared that the excessive leakage could result in a short circuit. He got the deputy registrar, co-operative housing society, to issue necessary directions to the housing society (i.e. the Committee members or more precisely the Chairman and Secretary). Ghansharamani claimed Rs 51,900 which he spent to repair the damage as well as compensation. Ghansharamani was branded as a permanent disgruntled member having the habit of making false allegations against the society office-bearers. Reportedly the Committee had agreed to bear 50% of the costs. As Ghansharamani’s claim was well-supported by documentary evidence and photos meticulously presented, the Forum expressed. “We are also of the view that the society has failed to pay attention towards complaint made by the complainant by deprecating him as quarrelsome. We are of the view that the complainant has proved deficiency of service on the part of the opponent,“ the forum said. The M C S Act 1960 is quite candid about the Committee performing as contemplated under the Bye Laws in terms of providing services to its members. The M C S Act 1960 under Section 73 (1AB) provides: “The members of the committee shall be jointly and severally responsible for all the decisions taken by the committee during its term relating to the business of the society. The members of the committee shall be jointly and severally responsible for all the acts and omissions detrimental to the interest of the society. Going by Forum’s view Ghansharamani’s complaint was against the Society i.e members of the Society including himself. Forum confirmed that there did arise a deficiency in service of not “undertaking necessary repairs in a timely manner” When it is said, that the Society provides services to members” it practically amounted to self service as the Society is made up of “ Ghansharamanies” So who compensates whom for deficiency in service? Who provides deficient service? Point to ponder. Ghansharamani rightly went to Registrar’s office and got directions issued to the Committee (not to the Society) and that was keeping in mind the potential follow up actions under Proviso to Section 73[1AB] as reproduced above. The fact that Ghansharamani had to perform some acts himself which was primarily the responsibility of the Committee and the office bearers especially and the forum subconsciously admitting to this being a fit case for compensation but for not burdening the Society it was withheld, all this point finger to this least explored dimension. Reference to “voluntary service” has a direct nexus with this dimension. Ghansharamani should without giving up, agitate on the basis of provision of Section 73[!AB] before the Registrar to hold the office bearers personally liable to pay compensation withheld (not negative) by the Forum thus indirectly conceding that in fairness, it ought to have been paid to Ghansharamani. Compensation amount cannot be charged to the Society like penalties inflicted on Company directors is not reimbursable to the directors. A time has already arrived to integrate this dimension fully in all cases of deficiency in service by the Society examined by Consumer forums. 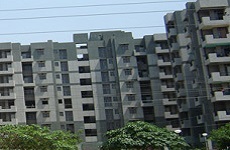 In the year 2009 (TOI April 2) the Central Mumbai District Consumer Disputes Redressal Forum dis impose a penalty of Rs 7,000 on the secretary of Chandra Bhuvan Cooperative Housing Society at Bhoiwada for not replying to a letter sent by a resident of the building. The Secretary was discharging duty which the Society was required to attend. Secretary not attending to a letter is the failure of the Society. Curiously though it was a case under the Consumer Protection Act 2005 the petitioner’s counsel argued that the new amendment in the Maharashtra Cooperative Societies Act Clause 73 (1 AB) put the onus on the secretary of the housing society. Section 73 of the Act states that every member is required to execute an indemnity bond within 15 days of taking charge of the office. According to the bond, the committee members are responsible for all actions taken by the society. The consumer forum ruled that since the secretary had not replied to the member’s letter it was deemed that a deficiency of service and negligence of duty under the Consumer Protection Act 2005 had taken place. This ruling was not under Section 73[1AB]. The Forum did not view it as an institutional deficiency but was a personal in-action. The Forum’s thinking seems to have been impressed by provision in the M C S Act 1960. Byculla (E) Mumbai – 400 027. Subject:- BMC Violations Rules and regulation for Builder Madanlal Gupta (Basant Vikas Developers) Vikas Centre Dr. C .G Road,Wadhavali Chembur,Mumbai-400074. Approved Plan Sanction File no : CE/5928/BPES/AM Relating to Basant Vikas Developers. I am senior citizen, I have been righting my grievances last 7 years to all departments in Maharashtra Government & Central government but till today No action has been intended by the competent authority. I would like to inform that the Principal Secretary Urban development Govt of Maharashtra/ Chief Secretary/ Housing Minister Govt of Maharashtra/ BMC Commissioner/ Chief Engineer Development plan/ Executive Engineer Building proposal Eastern Suburbs/ Law Department/Legal department /Public Relation Officer (Brihanmumbai Municipal Corporation) Housing Minister Govt of Inida/ Ministry of Urban Development Section Officer/ Honorable Law Minster of India/ Law Department Govt of Maharashtra, has ignored Rule & Regulations for the Builder. I would like to inform that there a Bombay High Court Receiver Shri.K.D.Rane Section Officer Suit Section on the Land and the Bombay High court case no : 1419 of 2006 on the same Survey no :24, CTS No-101,96 & 97 Of Wadhavli Village,Chembur and BMC has ignored the High Court Receiver and has issued Occupation Certificate to the builder. Is this not a violation & the builder has been spoon fedded by the BMC. No law of the land is there to which this builder is afraid. BMC & builder are hand in glove with all the violation activity. The builder is not afraid to any one and threatens me to run away till today no action. I being senior citizen am seeking justice from you. 	BMC Commissioner Compliant Copy. 4. The Hon’ble.Chief Minister of Maharashtra State. 5. Honb’le.Dy.Chief Minister of Maharashtra State. 8. The Law Officer Human Rights Commission of India, New Delhi. 18. Mr.Shreekant Singh – Principal Secretary Special Project-Urban development. 19. The Law Officer Maharashtra State. 29. Shri H. B. Patel. (Secretary) Law & Judiciary- Maharashtra Government. 30. Shri.V.K.Sharma Joint Secretary (Admn), Min. of Urban Development. 31. The Ward Officer M Ward BMC. 33. The Solicitor General of India. 34. Shri.Rahul Shewale Member of Parliament. 36. The Registrar Mumbai High Court. 41. The Law Officer Human Right Commission- New Delhi.